At first I stopped eating meat and only later I learned why this had been the right choice. I was still a little girl when I realised that it was not right to talk how much I loved my dog, how much I liked all those cows and sweet piglets and chew on a drumstick for lunch. At first, it was only an emotional move. I knew they were dying, dying because of me, but I didn't know how or why. How they lived up to the day of their death and people kill them. Slowly, I found out the horrible truth. I understood. Sometimes, you happen to hear things you don't ask, then you ask questions, read about it and, finally, all those numbers and pictures suddenly get a meaning. I knew all the facts about animals tied to such a short rope that they could not even turn their heads, about pigs pushed onto the bars. I also knew many of them were being killed by a hammer, and calves were separated from their mothers only few days after being born. I became aware of the fact they thay feed the animals corpes of other animals, give them antibiotics and hormones, and that they spend their lives not seeing the sun-light or smelling the fresh air. I knew all that. I had to know all about it, due to my profession. Still, nothing could prepare me for the shock of a visit to one of the farms. Even today, when I go there regularly, when I face the suffering, I am still not prepared. I still don't know how to deal with it. I know my words are marked by pathos but that's the way things are. Industrial farms are actually much worse than you can imagine! All the books on how to become a vegetarian, articles, even films, nothing can describe it. 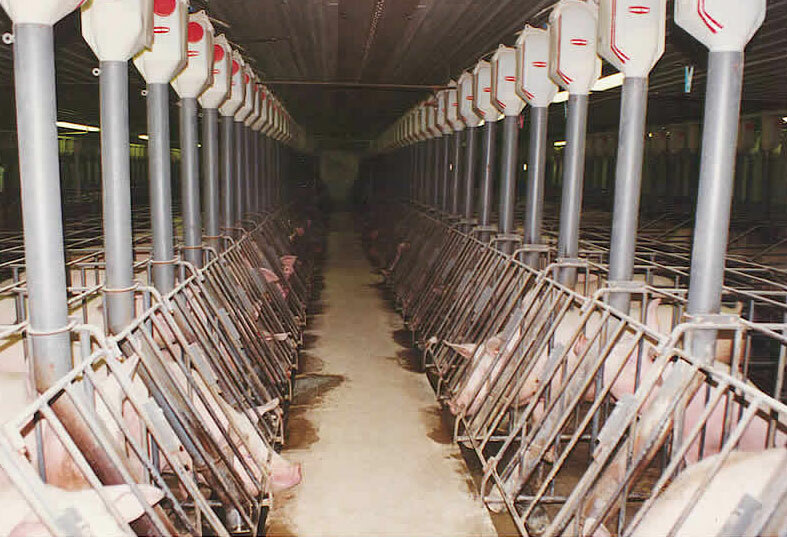 Can you imagine pigs so fat that their legs cannot support their bodies and they spend thir lives lying on the concrete, pushed by the iron bars, and pork is simply being extracted from it? Just imagine this: you have a terible itch, a huge fly is on your leg, and you cant chase it away or scratch your leg because you're tied. Thousands of cows have to experience that every day. All those stories on Croatian breeding... it's a ll a fraud. Import and export of animals, which have lived in even worse conditions up to the moment of transportation, driven for thousands of kilometres pushed in a truck to be forcefully fed for another few weeks and sold as a domestic product. Pigs have to undergo a testicals removal. With no anesthetics!!! 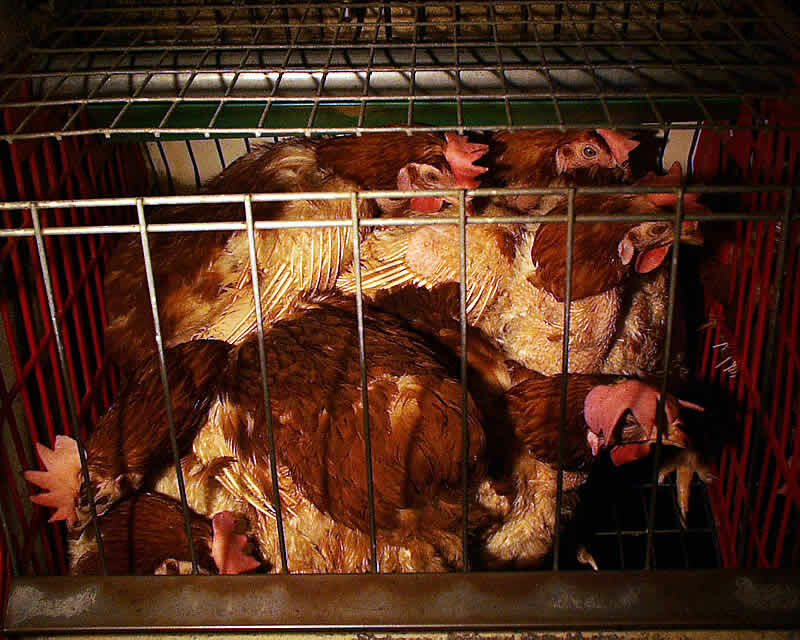 Hens undergo the same treatment, but this time, their gut s are being cut and searched with tweezers to find two tiny grains, their testicles, to get "capons" - meat of better quality. I'll stop. But before that, here's one last picture. Pig farm. Hangar with no air, humid as in the tropical belt. The metal cages are opet on the upper side and lifted a litle bit so that droppings could fall out. 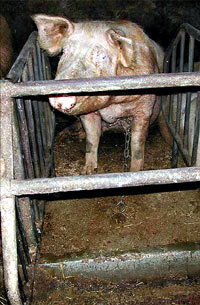 Thousands of piglets are pushed inte such cages. The'd like to run and play but they can't. A certain procentage of them die each day and are thrown into the passages between the cages. They are colected several times a day. Pools of droppings - fat rats' paradise which run around and feed on the corpses. Some stronger pigs learned how to jump out of a cage so they run around too, a nibble on the corpses as well.